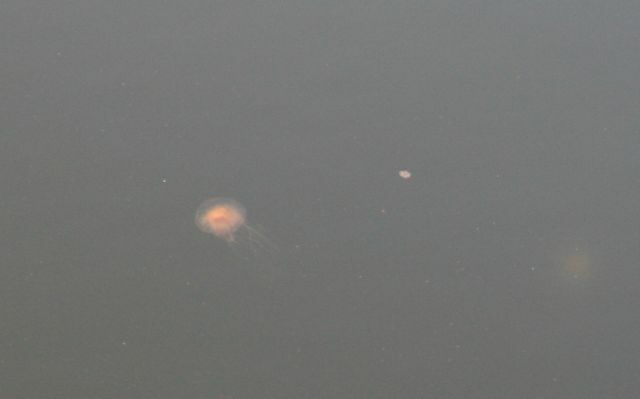 The bloomin' jellies are bad news for certain fish that have just spawned. Their little baby larval fish have to compete with the jellyfish for food (since both eat microscopic plankton). Now add in the Chesapeake Bay's pollution problems. Farm run-off, fertilizer from suburban lawns, storm sewer overflows--it all adds up to tons of nutrients, dumped in the bay. The nutrients make plankton bloom, and plankton are jellyfish chow. Meanwhile, the polluted, oxygen-depleted waters are bad for most fish. But jellyfish do just fine when oxygen levels are low. To top it all off, on a nice warm day, fuggehabout going swimming. The jellyfish, which sting, are just too thick in the water. What a mess! Jellyfish are beautiful and fascinating to watch, elegant in their simplicity. But you really can have too much of a good thing. Want to see where we are? Check the latest photo album on the SlowBoatCruise facebook page. And . . . here's a NOAA project that predicts where jellyfish are thickest--so you can go swimming elsewhere.